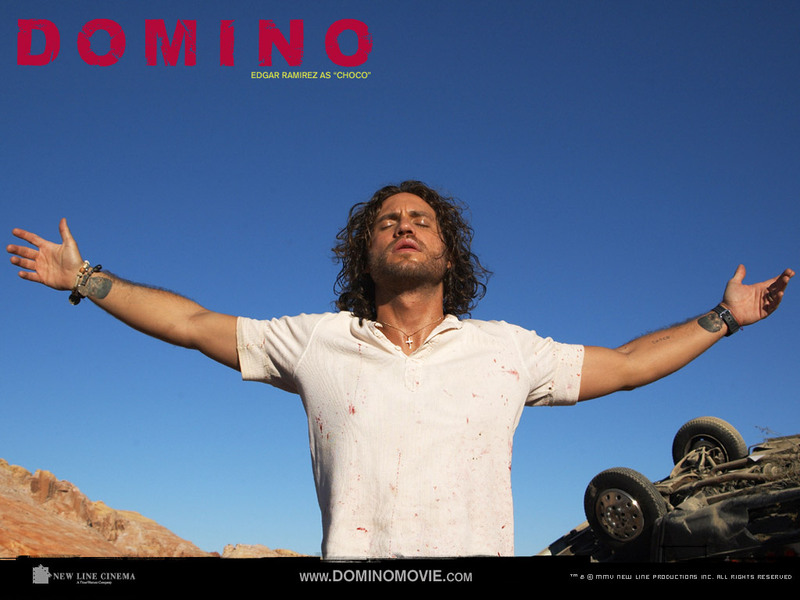 A NAUSEATING INSULT, DOMINO IS THE film equivalent of the music mashup from Hell. Imagine some ungodly megamix of Jessica Simpson, Crazy Frog and System Of A Down, flipped and diced by frat-rocker Fatboy Slim and MTV directed by a moron who shoots beer commercials. Scared? You should be - you're only halfway to approximating the ugliness of Tony Scott's scary show. Scott's many crimes against cinema - see the vomit-font subtitles of his sadly indicative Man On Fire, how post-everything! - lead us to expect little from his department. But it's the embarrassingly "hip" script from Donnie Darko's Richard Kelly that's just as much to blame here, loaded as it is to breaking point with turgid attempts to be "meta" and film-within-a-film-within-a-filmwithin-a-film.... zzzzzzzzzzzzzzz. It's enough to make you suspect those boo-happy Cannes snobs may be right about his ill-received Southland Tales. Kelly bases his premise on the true story of Domino Harvey - played by Knightley as electroclash collagen poppet - the daughter of Brit actor Laurence who was a model before becoming an unlikely bounty hunter in the 1980s and '90s. Her story is intrinsically compelling, but Kelly and Scott clearly don't think so: they spend most of their time butchering the narrative with witheringly un-clever devices (flashbacks, reality shifts, etc) that cause Domino's tale to vanish into a haze of masturbatory filmschool technique. Kelly's conceits might have played were they spiked with a shred of wit or imagination. But Domino is unfunny and lacks insight, and Scott seems to know it. He never takes his finger off the remix button, meaning scenes play out in microflashes and dialogue is chopped and scratched like a beatmixing jock cutting loose on his first day at DJ school. With so much visual and audio noise, the traces of inspiration are impossible to distinguish. A subplot involving two 90210 hasbeens amuses briefly, as does Christopher Walken as a manipulative reality TV producer. But it's all dead potentials: in the story, in the cast; in the way Kelly has fallen flat on his face before Scott arrives to beat him down. Domino isn't a film, it's a 90-minute commercial headache made by people who don't have a clue what the product is that they're shilling.